Scarce DS, one page, 8.5 x 14, January 15, 1896. 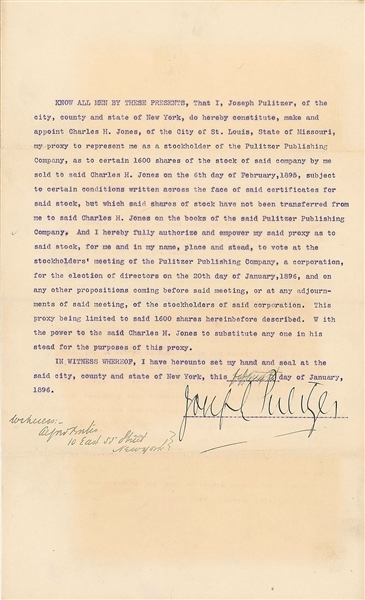 Pulitzer appoints a proxy for a stockholders meeting. In part: “I, Joseph Pulitzer…do hereby constitute make and appoint Charles H. Jones…my proxy to represent me as a stockholder of the Pulitzer Publishing Company as to certain 1600 shares of the stock of said company by me sold to said Charles H. Jones on the 6th day of February, 1895…but which said shares of stock have not been transferred from me to said Charles H. Jones on the books of the said Pulitzer Publishing Company.” Signed at the conclusion by Pulitzer and also signed by Alfred Bates as a witness. Areas of scattered mild toning, otherwise fine condition. In 1878, Pulitzer had married Kate Davis, sister of William Leonard Davis. By the end of the 1880s, he was virtually blind and most of his documents were signed by secretaries, making this an especially rare offering.